Leading American entrepreneur David MacNeil, owner of MacNeil Automotive Products Ltd. in Bolingbrook, Ill., has taken delivery of a new customized Airbus H145 helicopter for use with his highly successful company that manufactures the acclaimed WeatherTech automotive products. MacNeil flew away from Airbus Helicopters Inc.’s Grand Prairie headquarters after a final inspection and acceptance flight in his new helicopter, the second Airbus model he has purchased. MacNeil already operates an Airbus H125, and he said his experience with that aircraft made the decision to buy a new Airbus product an easy one. The H145 provides a roomy cabin that can seat eight or more passengers. 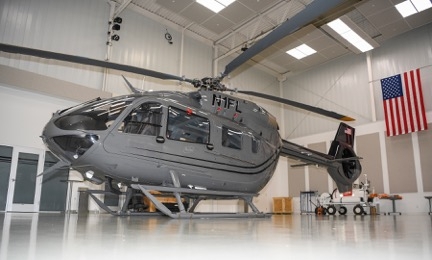 It features the Airbus Helicopters developed Helionix avionics system, including a standard 4-axis digital Automatic Flight Control System for reduced pilot workload and improved situational awareness. A Fenestron enclosed tail rotor dramatically reduces noise levels. The Turbomeca Arriel 2E engines, with dual channel FADEC, generate 951 shaft horsepower for take-off and allow improved hover and one-engine inoperative performance, as well as increased maximum gross weight capability. MacNeil has built a highly successful automotive accessories business. His entire WeatherTech product line, which consists of floor liners, floor mats, cargo liners, side-window deflectors, car covers, license plate frames, mud flaps, pickup truck bed liners, BumpSteps and home/business doormats, is made in America. Airbus Helicopters will showcase an H145 at Heli-Expo 2017, March 7-9 in Dallas. Airbus Helicopters, Booth #7648, will exhibit several industry-leading aircraft models, a virtual reality experience demonstrating the cutting edge technology of the H160 helicopter that is under development. Subject matter experts available to discuss the company’s support and services offerings, including HCare maintenance and spares support programs, and the Keycopter online portal.